"Snow day" redirects here. For other uses, see Snow day (disambiguation). 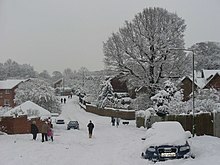 United States Office of Personnel Management notification that Federal agencies in the Washington, D.C. area would be closed on December 21, 2009, due to the North American blizzard of 2009. 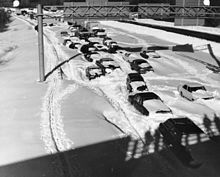 In most areas, schools include extra days in their calendar as "built-in" snow days which allow a school to get in the minimum number of hours or days for instruction (in Wisconsin for instance, 180 minimum teaching days are mandated by law). When the number of snow days taken is less than the number of built-in days, the days are given back by extending Memorial Day weekend, or making the school year end earlier. Once the number of snow days taken exceeds the number of built-in days, the snow days must be made up. In other states, like Maine, all snow days must be made up. For example, schools may open school on some federal holidays, hold classes on Saturdays, shorten spring break, or sometimes make the school year end later. However, some schools are more forgiving, and do not mandate make-up days. 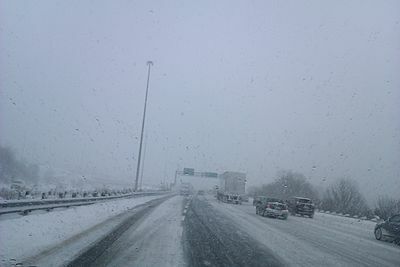 In the event of heavy snow, tools have arisen to help students calculate the chance of a weather-related cancellation, most commonly snow days. Some schools in Sydney and New South Wales may, at their discretion, close when temperatures reach above 40 degrees Celsius (104 Fahrenheit). 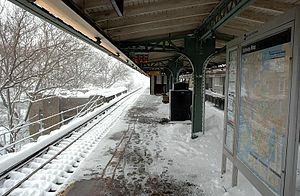 Passenger trains may face a diminished ability to operate in severe snow, like the New York City Subway during the 2006 North American blizzard (pictured).